Playing for Cake, a Community Interest Company (CIC) based in Sheringham, Norfolk, delivers participative, interactive music and singing workshops to groups of people to improve their health and wellbeing. The brainchild of Tina Blaber-Wegg and her Co-Director, George Crawley, Playing for Cake works closely with people who are living with a range of physical or mental health conditions and their carers to improve their health and wellbeing. This includes people living with dementia, people with disabilities and those with respiratory conditions. Tina says that anyone experiencing physical or emotional difficulties, including as a result of stress, can benefit from taking part in musical activities in a fun and relaxed way. We spoke to Tina about her passion for Playing for Cake and the impact it is having on local people. What motivated you to establish Playing for Cake? We feel this is a massively under-funded and under-resourced sector. There is so much potential for different people to benefit from taking part in participatory music sessions. Having used music as a way of supporting my own recovery and return to work following a bout of ill-health, I went on to earn a Performing Musician award in 2007 through Access to Music. I established a community ‘Jam Club’ in Sheringham in 2011, which still runs to this day, and met a variety of like-minded people who found confidence and friendship in performing music. Sadly, one of the band members was diagnosed with early-onset dementia. We have supported this musician to enable him to keep playing. It provides much pleasure to him, and provides his wife with some respite. 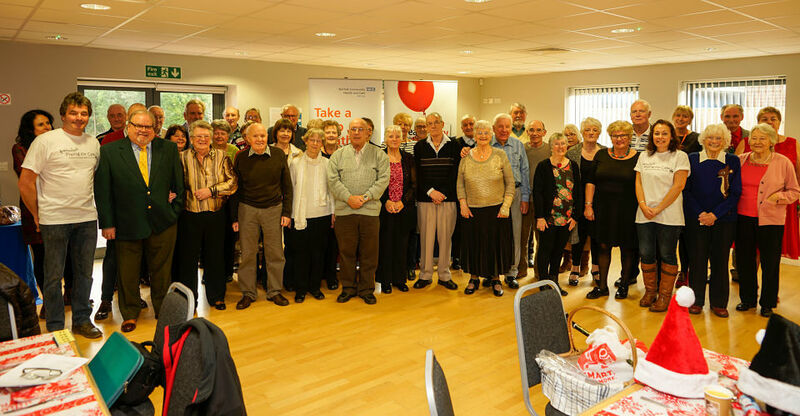 It is this experience that has led to us, alongside another community musician, Jane Wells, to set up Playing for Cake as a CIC, with the aim of bringing singing or music workshops to other groups of people to benefit their health and wellbeing. “Working alongside Business Advisor, Paul Walmsley, through the New Anglia Growth Programme, we increased our knowledge and understanding of business planning. Our first customer was The Danbury Unit – a specialist dementia unit at Halsey House in Cromer. This experience was fantastic because it helped us to realise that we genuinely had a skill and service to offer, and that we were both wanted and valued by a highly-respected organisation in the sector. In order to improve our business skills, and to understand the process of setting up as a Community Interest Company, we sought the advice of Nwes. Working alongside Business Advisor, Paul Walmsley, through the New Anglia Growth Programme, we increased our knowledge and understanding of business planning. Nwes were a great source of support and advice during this process. Most importantly, Paul really believed in what we were doing, which was a tremendous source of encouragement! We are willing to face challenges head on, and have recognised that fundraising is likely to be an ongoing issue. We were delighted to receive some financial support from organisations, which allowed us to develop our offering to include a ‘Friday Group’ – a group of disabled adults that meet weekly in North Walsham. We enjoy what we do, and we firmly believe that our fun and relaxed music sessions can brighten up the participants’ day! We are already working with Mandy Beresford, Respiratory Nurse Specialist and Chair of the local Breathe Easy group to set up singing workshops and I am hoping to attend specialist training run by the British Lung Foundation in April. This expertise can also be used across other groups we work with. We are also hoping to deliver some sessions in partnership with Creative Arts East for people living with dementia, and their carers. We have just been awarded £250 by the Cromer and Sheringham Crab and Lobster Festival towards a joint project with the Alzheimer’s Society to deliver sessions to members of the Sheringham dementia café. In the future, we would like to have drawn up considerable expertise and knowledge in relation to a wide range of conditions. With additional plans including fundraising, establishing a bank of support musicians and volunteers, and developing our contacts with healthcare professionals, we are in no doubt that Playing for Cake will be a success. What advice to do have for others considering setting up a business? Just get out there and make a start. Yes, business planning is pretty essential and getting support on this through Nwes is a great place to start. Additionally, get out there and start talking to people about what you want to do. You’ll learn so much from others in the field and from general networking.